The corporate office is dead. Long live Starbucks. Will you hire employees who think they're entitled to spend an hour or more of their workday visiting social media sites? Technology has changed everything we know about the office. Now it is threatening to get rid of the office as we know it. A series of surveys undertaken by Intelligent Office, a virtual office space provider, show just how profound this shift in attitudes toward traditional working environments has become. Chief Operating Officer Tom Camplese sums up the results simply, saying "We believe there is a paradigm shift happening in our culture as it relates to work style. The work culture of today is very different than it was even 10 years ago, and individuals are now aspiring to work differently and create not only their own work style, but their own work rules." Three thousand people, Americans and Canadians aged 18 and up, were surveyed over an 18-month period that ended this April. The results paint an interesting picture of a rapidly evolving modern work force. The desire for unprecedented work flexibility is the key touchstone of the surveys. That flexibility is manifest in just about every facet of the work environment. Workers want to decide where they work (home, office, coffee shop), when they work ("9 to 5" is all but dead), and how they work (preferring to use their own equipment over corporate-issued machines). Already, 70 percent of workers say they work from an alternative location than the office on a regular basis, and 66 percent said they use or want to use a laptop or tablet to allow this kind of flexibility. Today's employees don't want Big Brother looking over their shoulder during the workday, either. If they want to check Facebook or send a few tweets during the day, the modern worker says he feels that should be allowed. 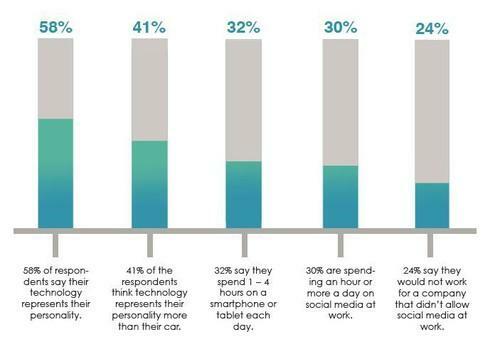 If it's not, unemployment is going to skyrocket: Nearly a third of respondents to the surveys said they spend at least an hour a day on social media while at work, and a quarter of respondents said they wouldn't work for a company where social media wasn't allowed. Heck, even getting a job at the world's largest retailer isn't what it used to be. Echoing some of these trends, Reuters recently found that most Wal-Mart stores had stopped hiring full-time employees altogether, instead relying almost exclusively on temporary workers. Reuters notes that this is the first time the company has done this outside of the holiday season. Wal-Mart calls the temp workers, which now make up nearly 10 percent of its workforce, "flexible associates."